Nothing underlines the importance of flood insurance like a Major Weather Event. The damage inflicted by Sandy—the hurricane turned “post-tropical cyclone”—has thrust flood insurance back into the news. Considering the unexpected swath of wreckage delivered by Hurricane Irene in August 2011, it’s smart to review the implications of not having flood insurance for your property. If you live in a flood-prone area and have a mortgage, chances are that your lender already requires you to have the right coverage. Be aware, though, that standard homeowners’ and renters’ insurance does not usually cover flood damage. Start assessing your risk by investigating the likelihood of a flood in your home. Don’t rely on old maps. Flood zones are redrawn regularly by the Federal Emergency Management Agency (FEMA). The latest flood zones are at FloodSmart, a federal government portal. Even if you are not in a flood-prone zone, consider the risk-to-benefit ratio of having coverage anyway. People in the mountain valleys of Vermont assumed that they were situated above the high-water mark, only to see whole towns swept away by Irene’s flash floods. The Insurance Information Institute estimates that the highest-risk areas have a 26% chance of flooding over the span of a 30-year mortgage. • Expect to pay about $600 for flood insurance in a low-risk area. • There is a 30-day waiting period before a new policy goes into effect, which means you literally cannot get flood insurance while the waters are rising. • Scour your policy to understand what technical weather terms may affect the scope of your coverage. Different insurance formulas cover different weather events, even if the damage is the same. So when Hurricane Sandy was relabeled a “post-tropical cyclone” by the National Weather Service, insured homeowners were covered by a different deductible formula. • Make sure you buy sufficient coverage. 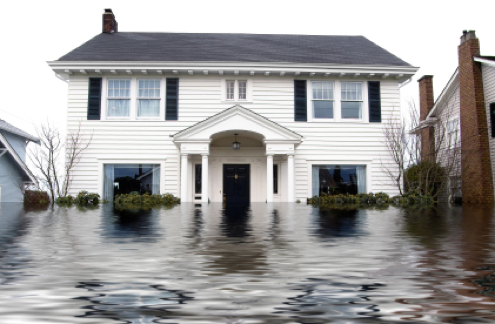 The Insurance Information Institute reports that, on an actual cost basis, the standard flood policy covers houses for up to $250,000 for replacement value (and contents for up to $100,000). If your home and contents are worth more than that, consider taking out a supplemental private policy. For more information, visit FloodSmart.